Our 20th anniversary! Let’s roll a bunch of New Belgium together and out it in a bottle. Start with the backbone of Fat Tire, but double the malt and hops; add in Asian pear juice, a very Belgian thing to do; and bring it to life with a saison yeast. 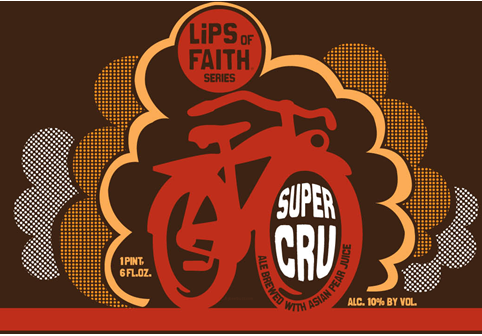 It’s New Belgium Super Cru from us to you! As I was pouring this beer out I was trying to determine the perfect way to describe the color. As I was stumbling over terms like “orangish-amber” and “copper/gold” I kept thinking of peaches. Then I realized, “oh, it’s peach colored”. I never claimed to be mentally quick. The head is short lived, but does leave a film behind when it goes. As with most Belgian/bottle conditioned beers, the carbonation was quite lively and lasted until the very end. Green apple was the first note that jumped out of the nose at me. Shortly there after I picked up chocolate, banana, and strawberry. After a few whiffs I kept thinking of fermenting apples and white wine. As it warms the nose becomes increasing spicy, with notes of allspice and nutmeg (similar to a pumpkin ale). The yeast took center stage at the forefront of each sip: bananas and booze. Red apples (odd) and bubblegum (the yeast again) fill in the middle, with notes of chocolate-covered oranges and bready malts rounding it out. I really loved how different this beer was from Fat Tire, considering how close their grain bills were. Mouthfeel is light, but chewy, with massive amounts of carbonation in each sip. Bubbles fill your mouth, before giving way to a dryness that is not uncommon in saisons and Belgian beers alike. 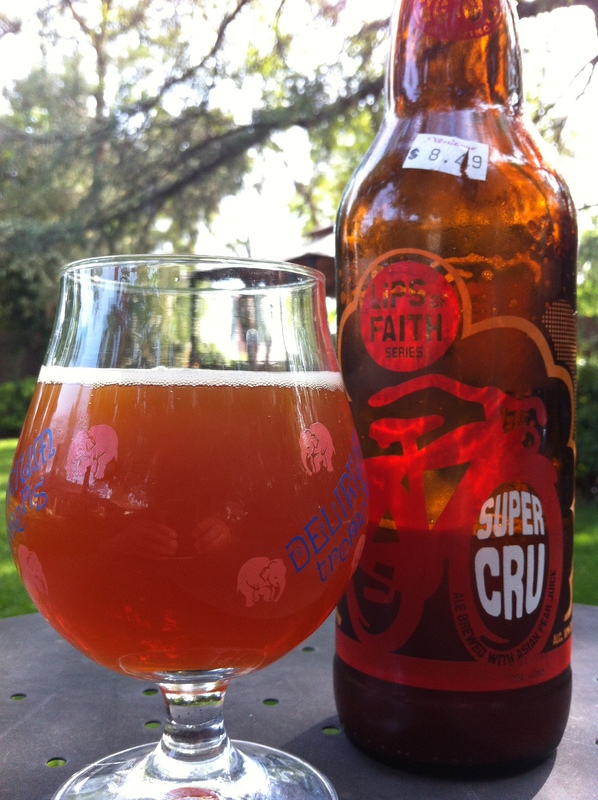 Super Cru is definitely a complex beer. I could really see this working at a dinner party where everyone else brought wine. It goes quite well with the warm spring day on which it was consumed. However, the high amount of alcohol in the flavor and the dryness keep this beer from being great.